"At stand of ponderosa pines cries out to me of openness and freedom." Full import of those words penned by Ron Strickland in his Whistlepunks & Geoducs filtered through the shade of a big ponderosa where I hunkered at 6, 000 feet elevation in central Oregon's high desert country. Until you've been there and done that, you'll not comprehend, even as I try to draw you there with me, my host, and other boon companions. 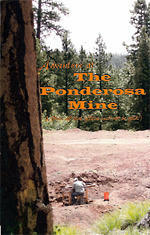 So begins the adventure told by author, Bob Wethern, of his adventures at the Ponderosa mine in the summer of 2006. Adventures at the Ponderosa Mine (Where All That Glitters Need Not Be Gold!) is an easy, pamphlet-style read, complete with full-color photographs. Told in the first person, Bob extols his adventures in the wilderness - of male bonding, "roughing it," and the age-old search for buried treasure. For your own copy, please contact us.